Every time the Christmas season rolls around, I start to have visions of a peppermint mocha. (Yum!) Seriously, I unapologetically enjoy all things coffee, but fancy coffee drinks can be a real budget breaker (not to mention full of sugar). Thankfully, there is an easy and delicious peppermint mocha recipe you can make at home with wholesome real food ingredients. I promise, this recipe is a much more delicious and healthy alternative! 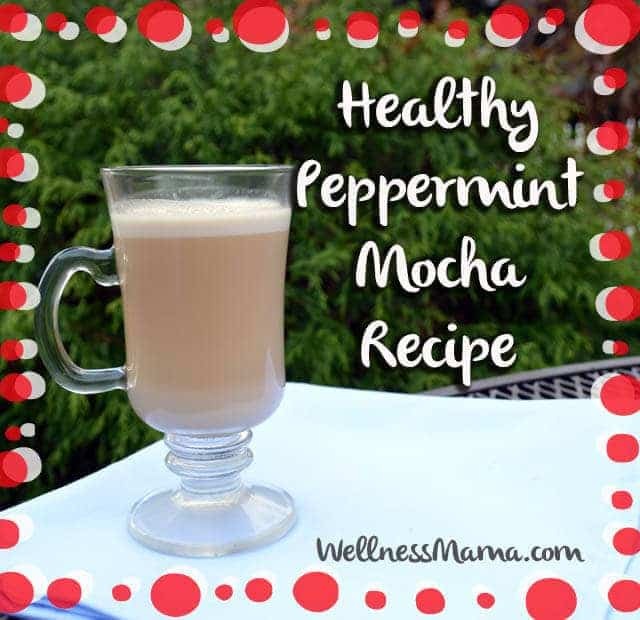 A Healthy Peppermint Mocha Recipe? In college, I often frequented coffee shops to get my normal caffeine fix. Now that I’m older and hopefully a little wiser, I make my coffee at home with organic beans. I don’t miss coffee shops at all since I can even make fancy coffees like pumpkin spice or vanilla lattes at home. They honestly taste just as good as the store-made version, or better in my book since I can use real food ingredients instead of junky artificial flavors and high fructose corn syrup. I often get asked “how do you get it all done with a blog and so many kids” and the answer is: having a structured schedule every day and consuming enough healthy fats. This recipe is packed with brain-boosting fats and it keeps me energetic, but not jittery, all day. The way I drink my coffee almost always includes a tablespoon of butter and some coconut oil or MCT oil for healthy fats and extra benefits. I’ve made variations of this recipe with coffee, decaf coffee, chai tea, and herbal teas and they are all delicious. All that’s needed is some brewed coffee, a few ingredients, and a blender to make your own peppermint mocha in just a few minutes. One word of warning: If you aren’t used to consuming coconut oil, start slowly as coconut oil and MCT oil can cause short-term nausea if you aren’t used to them. Coconut oil and MCT oil have immune boosting, metabolism boosting, and yeast-fighting properties, but if you jump in too fast your stomach might rebel! Make your own peppermint mocha with brain-boosting healthy fats and antioxidant-rich cocoa powder. Brew coffee and while still hot, pour into blender or large cup if using an immersion blender. Add other ingredients and blend on high for 10 seconds until emulsified. This step is important as it will create a creamy flavor instead of an oily one. If pregnant or nursing, do not use peppermint essential oil! Serve with my homemade marshmallows for an extra special treat! What’s your favorite coffee flavor? Share below!